Handheld carpet cleaners are small handheld portable carpet cleaning appliance that removes dirt and stains from carpets. Similar to handheld vacuum cleaners, they are light in weight (eg. 5 lb) and small. These small machines can be taken around the house or outside to clean car carpets and upholstery. Despite their small size, the best handheld carpet cleaners are full water extractors, as you will see with the Bissell Spotlifter Powerbrush 1716 and Bissell SpotLifter 1719 2X. That means you will be able to use the cleaners to apply a mix of detergent and water on the carpet, and then suction the dirty water out of the carpet. They usually have separate chambers to store clean water and collect back the used (dirty) water. They typically come fitted with bristles or brush-heads for scrubbing the carpet as well. If you are looking for a small and simple unit to clean up spots and stains on your carpets, car interiors and upholstery, a handheld carpet cleaner fits the bill. 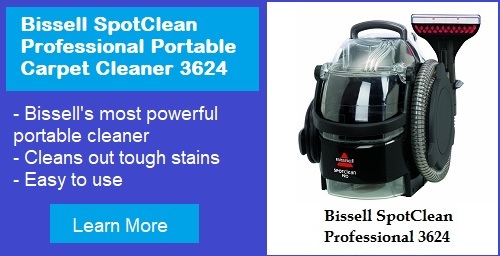 They are smaller but less powerful than a portable unit like the Bissell SpotClean Pro 3624. Besides taking up limited storage space, they are also priced lowest (around $50 to $60) amongst all types of domestic carpet cleaner machines. 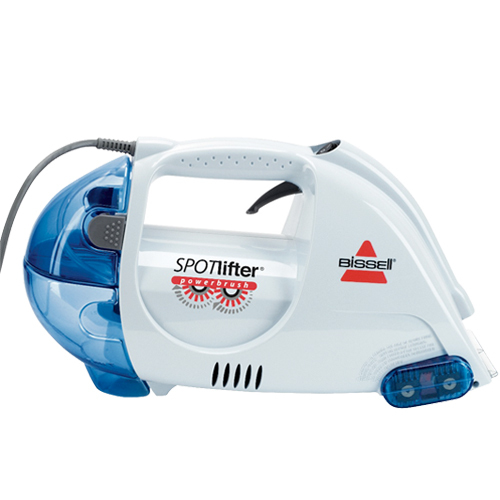 This Bissell Spotlifter Powerbrush 1716/ 1716B is an inexpensive carpet deep cleaner with features that you will find in larger portable cleaner models. It comes with an 18″ cord which is long enough to give you continuous cleaning without needing to unplug and plug it again on a separate socket. It’s light weight of just 4 lbs and small handheld size makes it easy and convenient to use. You can use it for cleaning narrow corners, stairs, upholstery, and other areas that may be more cumbersome to cover using regular-sized upright carpet cleaners. It’s been recommended by a few RV travelers for its cleaning effectiveness and small footprint for storage. This carpet stains cleaning appliance comes with a set of motorized power brushes and suction action to remove spots and stains on your carpet. You can increase the machine’s cleaning effectiveness by adding in Pet Stain and Oxygen Boost cleaning formulas that act on tough stains. The Spotlifter allows you to control how much cleaning solution to use with a spray trigger. You can also separate out brushing strokes from suctioning strokes, allowing for added cleaning flexibility. The brush and other parts of this handheld appliance are easy to remove and clean. This portable Bissell SpotLifter 1719 2X Portable is a cordless deep carpet cleaner. It is also sometimes referred to as the Bissell SpotLifter 2X Essential. This allows customers the freedom to use it anywhere. The Bissell SpotLifter 1719 cordless is very similar to the corded Bissell Spotlifter Powerbrush 1716. Besides being cordless, another main difference is that the Bissell SpotLifter 1719 cordless does not have a motorized rotating brush like its corded counterpart, the Spotlifter 1716. 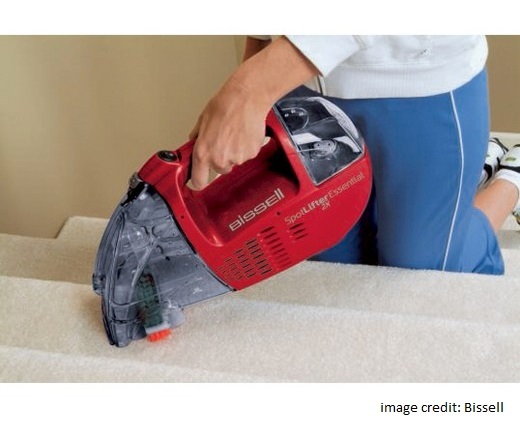 The Bissell SpotLifter 2X Essential 1719 comes with a scrubbing brush-head behind the nozzle and when applying cleaning strokes, the carpet is manually scrubbed with the brushhead. This results in a lower noise level, but you will have to put in some elbow grease. Each charge takes at least 12 hours and a full charge is good for up to 15 minutes of continuous carpet cleaning. Some customers find this long charging time a hassle. Like the Bissell Spotlifter Powerbrush described above, this carpet cleaner has a dual tank system with a tank each designated for clean water and dirty water respectively. This allows for easy disposal of dirty water. In general, the corded version, Bissell Spotlifter Powerbrush 1716, has higher customer satisfaction. Unless you have an obvious need for the cordless feature, the Bissell Spotlifter Powerbrush 1716 is a safer bet. These are the best handheld carpet cleaners on the market today. 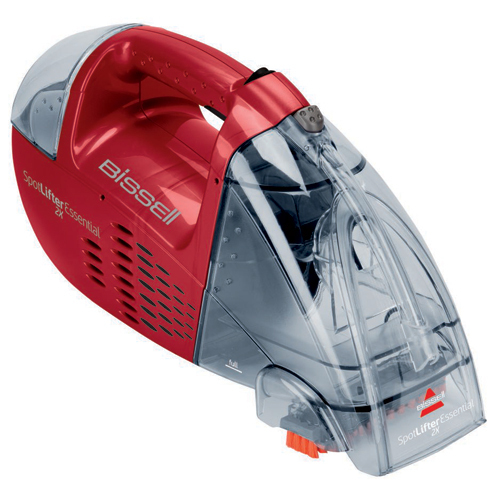 Bissell has made them easy to operate and are useful for cleaning emergency spills and stains. Many customers have pets at home and their carpets are susceptible to all kinds of pet stains and messes. These appliances allow them to maintain the cleanliness of their environment without too much work. Handheld carpet cleaners are sometimes referred to as portable spot cleaners. To be more precise, they are a subset of the category. They are the smallest versions of portable spot cleaners – the entire carpet cleaning appliance weighs a few pounds. It can be lifted up, taken anywhere and used. Typical portable spot cleaners, although portable and light, are still heavier and cannot be handheld. They require the use of a separate attachment hose. If you prefer a slightly larger unit with more cleaning power, portable spot cleaners are the next level up. For more choices, check out our Portable Carpet Cleaners Reviews section.